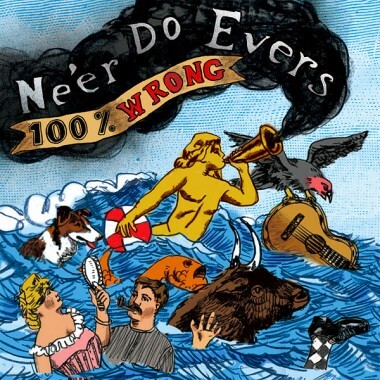 Borne of the pulsating musical scene that is post-millennial Brooklyn, The Ne’er Do Evers have been making their chaotic punk-pop since August of 2003. With a line-up of experienced musicians playing the songs of frontman Chris Buckridge (with more recent contributions from bassist Matt Moon), the Ne’ers are an animated mix-tape of anger, humor and vulnerability, each emotion likely to merge into and/or trample on the others at any moment. The Ne’ers play music that is fifty percent heavy thoughts and fifty percent knee-jerk reactions with a sound best described as full-on in-your-face visceral mooning, a distillation of art, alcohol and attitude—not only intoxicating but mind-numbing in a good way. 100% Wrong is the Ne’er Do Evers’ most recent record. A return to the studio, the first for this line-up, it also marks the entrance of group writing and arranging in the constantly-on-the-move Ne’ers dynamic.